Six months passed from the initial design until now, but it wasn’t exactly six months of continuous work. After a short spurt of activity last summer, the project sat collecting dust on my desk until I recently picked it up again. Sometimes it’s hard to find motivation! The “Liron” disk controller was introduced by Apple in 1985. More formally known as the Apple II UniDisk 3.5 Controller, it’s designed to work with a new generation of “smart” disk drives more sophisticated than the venerable Disk II 5.25 inch floppy drive. The smart disk port on the Liron is appropriately named the Smartport, and it can communicate with block-based storage devices such as the Unidisk 3.5 (an early 800K drive) and Smartport-based Apple II hard drives. Why care about the Liron? The Apple IIc and Apple IIgs have integrated disk ports with built-in Smartport functionality, but for the earlier Apple II+ and IIe, the Liron is the only way to get a Smartport. For owners of the BMOW Floppy Emu disk emulator, the Liron card makes it possible to use the Floppy Emu as an external hard drive for the II+ and IIe. Unfortunately finding a Liron is difficult, and although they occasionally turn up on eBay, they’re quite expensive. That made cloning the Liron a logical first goal. John Holmes was kind enough to lend me his Liron card for examination. Later Roger Shimada made the generous gift of a Liron and a Unidisk 3.5. I’m indebted to both of these kind gentlemen for their help. The Liron contains an IWM chip, a 4K ROM, and a handful of 7400-series glue logic chips. It took a few hours to trace all the connections on the card and create a schematic. Except for the IWM, the exact functions of the other chips are all well known and relatively easy to implement in a hardware description language for the FPGA. Fortunately there’s a spec sheet for the IWM too, written by Woz himself, available if you search through dusty corners of the Internet. Based on that information, I was able to create an HDL model of the IWM for synthesis in the FPGA. It was a fairly big project, but I’d already done part of it back in 2011 for my Plus Too Mac replica. The first Yellowstone prototype was sketched out during a single hectic week. 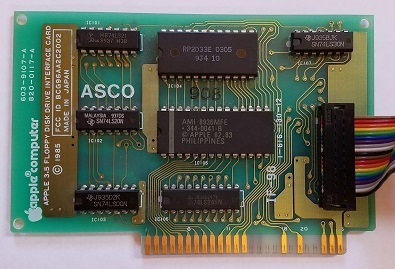 I’d never made an Apple II card before, but it’s just a standard thickness PCB with a specific shape and pattern of edge connectors. The core of the Yellowstone board is a Lattice MachXO2 FPGA, specifically the LCMXO2-1200HC. This 100-pin chip has 1280 LUTs for implementing logic, and 8 KB of embedded block RAM to serve as the boot ROM or for other functions. It also has some nice features like a built-in PLL oscillator and integrated programmable pull-up and pull-down resistors. Unlike some FPGAs, the MachXO2 family has built-in flash memory to store the FPGA configuration, so it doesn’t need to be reloaded from an external source at power-up. The FPGA can be programmed through a JTAG header on the card. Because the FPGA’s maximum supported I/O voltage is 3.3V, but the Apple II has a 5V bus, some level conversion is needed. I used four 74LVC245 chips as bus drivers. These chips operate at 3.3V but are fully 5V tolerant, and the Apple II happily accepts their 3.3V output as a valid logic “high”. One of the chips operates bidirectionally on the data bus, and the others handle the unidirectional address bus and control signals. The prototype card also has a 2 MB serial EEPROM. I’m not exactly sure how this will be used, but I’m hoping to find a way to load disk images from the EEPROM as well as load disks from a real drive. 2 MB is enough to store 14 disk images of 5.25 inch disks, or a single larger disk image. It’s not central to the design, but if it works it would be exciting. To make the physical connection to an external disk drive, I attached a short cable to another custom PCB with a DB19-F connector. The female version of the DB19 isn’t quite as difficult to find as the male, but it’s not exactly common. If Yellowstone eventually becomes a product and sells in any appreciable volume, obtaining sufficient supplies of the DB19-F will likely be a problem. After months of procrastination, and a long digression into what proved to be a faulty JTAG programmer, I was finally ready to put Yellowstone to the test. After a few quick fixes, it worked right away! I was very surprised, considering that the complex IWM model for the FPGA was developed without any iterative testing or validation. I got lucky this time. I’ve made it this far – phew! Next, there are lots of little things to fix on the card. Some parts are labeled incorrectly, it’s slightly too wide, some extra resistors and buffers are probably needed for safety, etc. Addressing all those items will keep me busy for a while. Second, I’d like to investigate cloning other types of Apple II disk controllers. 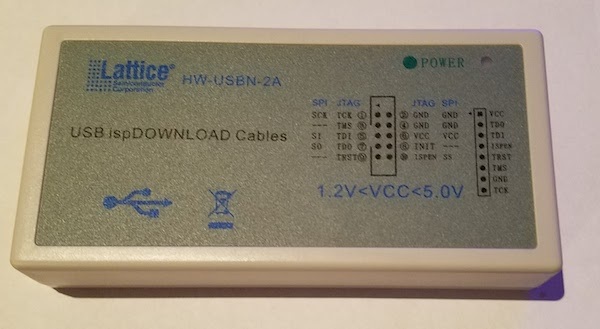 The Disk II controller card should be fairly easy to clone – or the Disk 5.25 controller, which is essentially the same card with a different physical connector. I’m about 90% sure I can make that work. I would love to clone the Apple II 3.5 Disk Controller too (aka the Superdrive controller), but that would be a much larger effort and I’m not certain it’s possible. I believe the real Superdrive controller contains an independent 6502 CPU and is quite complex. 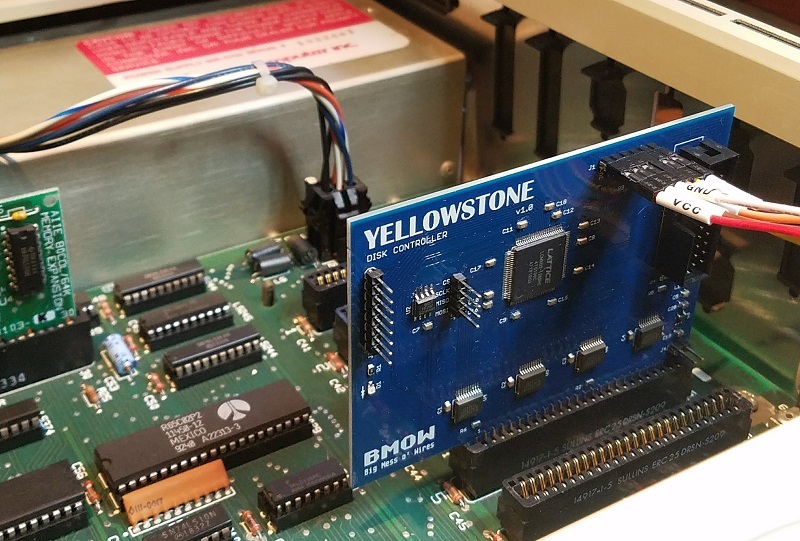 In theory the Yellowstone card could also implement other non-disk functions, although it might require a different physical connector to make use of them. A serial card maybe? Some kind of networking? A coprocessor? The elephant in the room is the question of Yellowstone’s ultimate goal. Is it a hobby project, or a product? If a product, how much demand really exists for something like this? How would the demand change, depending on what kinds of other disk controllers I’m ultimately able to clone? And how would Yellowstone buyers update the FPGA with new firmware for new clones and bug fixes? I probably can’t assume that every customer owns a JTAG programmer and has the tools and skills to use it. But I’m reluctant to add a USB interface or microcontroller that’s used solely for JTAG/firmware updates and is dead weight otherwise. I’m still waiting for a great solution to hit me. I’m happy the Apple II bus interface is so easy to understand and implement. Thanks to Woz for that. With just a ROM and a bit of glue logic (or their equivalents in FPGA), you can do all sorts of creative things. With today’s computers being such closed systems, I’m glad we still have antiques like the Apple II to provide an outlet for my electronics tinkering. Finally, the first real progress on the Yellowstone disk controller since last summer! Sometimes an error is a good thing. It doesn’t look like much yet, but this error demonstrates that the Yellowstone card is correctly decoding address references to its slot, and is serving up data from a simulated ROM inside the FPGA. In this case the ROM data is the firmware from a stock Liron card. The Apple II’s 6502 CPU runs the firmware, which tries to use the FPGA’s soft-IWM to find a Smartport-capable disk drive. It finds none, and prints an error message. Hot stuff. An error message is much better than having PR#5 crash the computer. That’s what happened on the many previous iterations of this test. The next step is to stick a logic analyzer on the card’s disk interface, and see if the I/O lines are moving as expected. If that works, I’ll connect a disk drive and cross my fingers. Time for a celebratory beer. 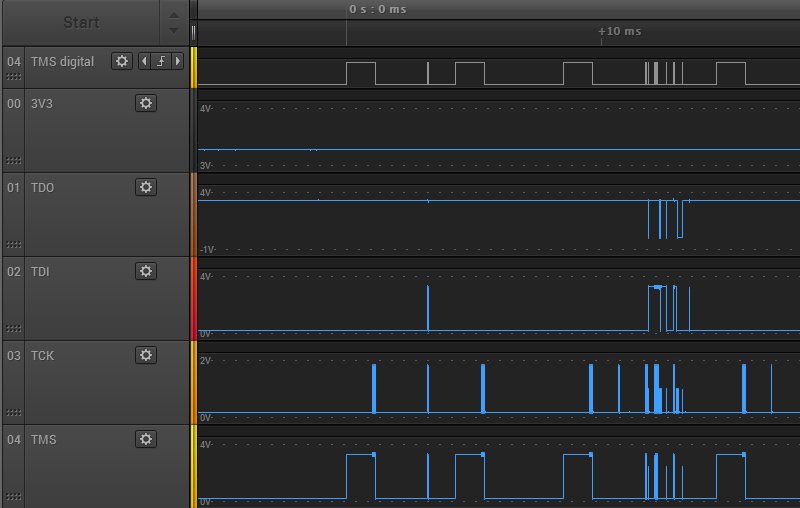 It might be some kind of noise or poor signal integrity on the JTAG traces. But the traces are quite short and don’t cross any other signal traces that might carry interfering signals. 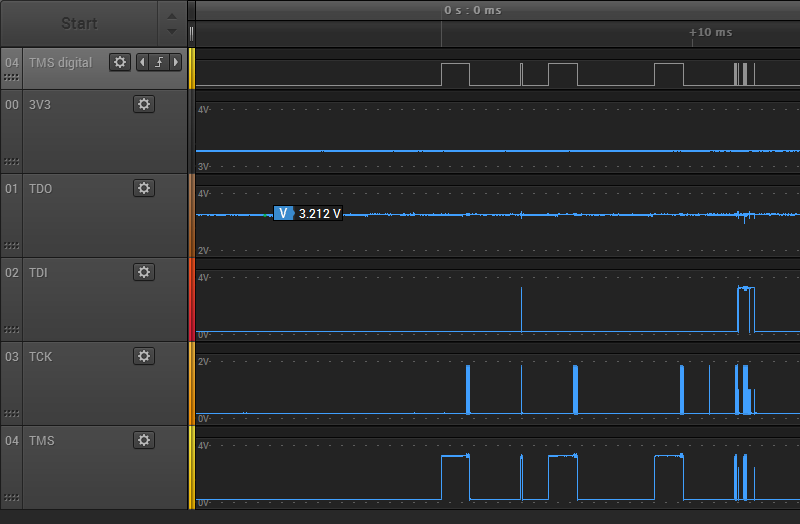 Maybe I have power problems, and the IIe’s 5V supply is drooping briefly when I try to program the FPGA via JTAG. 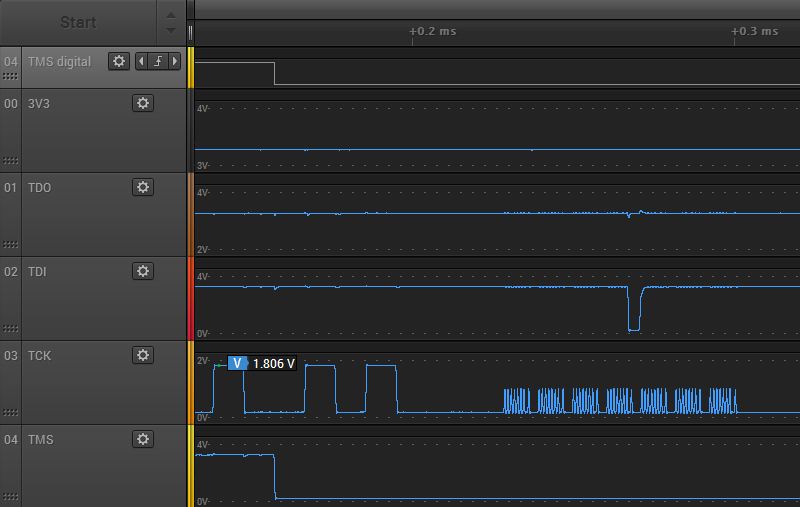 But I measured the 5V and 3.3V supply voltages during JTAG programming, and they look fine. There might be a ground loop, due to the Apple IIe and JTAG programming having different ground potentials. But I measured the difference in grounds, and it’s only 4.3 millivolts. Here you can see a couple of the 1.86V TCK pulses, followed by a whole mess of the runtier 0.97V pulses. Ugh. These should all be using the full range 0 to 3.3V, or something close to it. With a clock signal this bad, it’s amazing the JTAG programming still works. Do these graphs really reflect what’s happening? I’m a little suspicious that I’m running into limitations of the Saleae Pro 8’s analog mode. At 12.5 Ms/sec, it’s taking one analog sample every 0.08 microseconds or 80 nanoseconds. 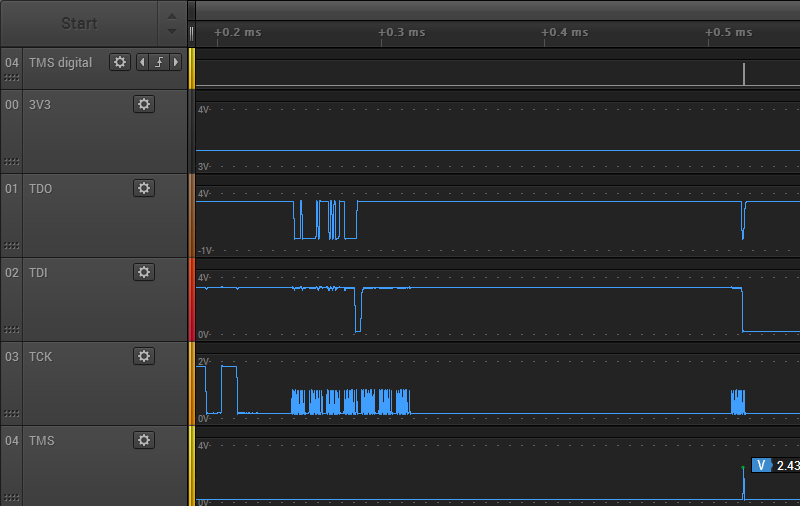 That’s pretty poor as scopes go, but the period of the JTAG clock is slow: about 1 microsecond (1 MHz operation). There should be 12.5 samples per clock period, more than enough to get a decent reading for the min and max voltage of each clock period. Therefore I think the graphs are accurate. My conclusion is that although external JTAG program succeeds, the JTAG signals look terrible. 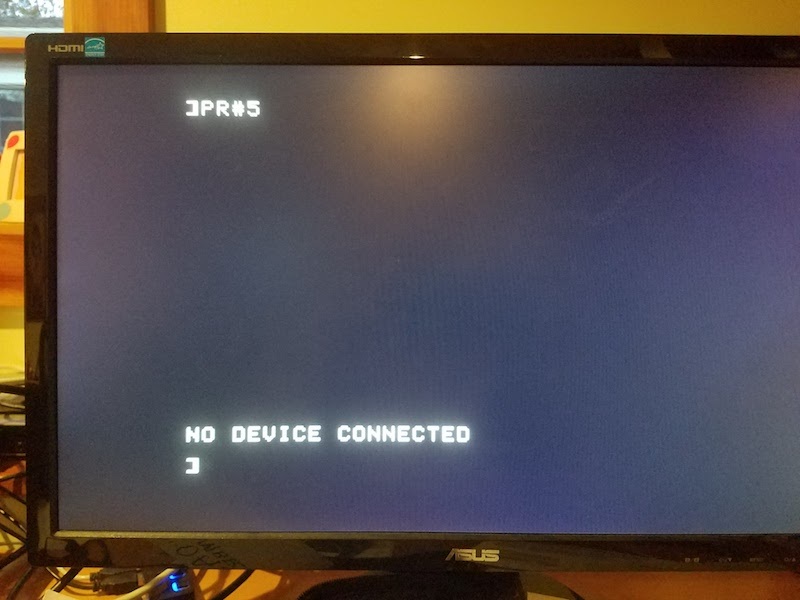 The fact that JTAG programming fails when the card is in the Apple IIe slot likely has little to do with the IIe, and everything to do with some other basic signal quality problem. The TDO high voltage ranges from 3.187V to 3.314V, so it’s about 10x noisier than during external programming. It’s still within an acceptable range though, so maybe this isn’t important. There’s not much opportunity for interference. The only PCB tracks that are crossed by the JTAG signals are voltage supplies and the disk I/O signals, which were unconnected during this test. The prime suspect is R3, a 4.7K pulldown resistor on TCK. 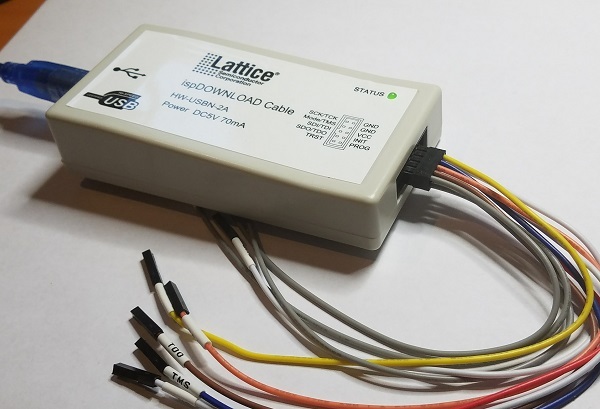 This was recommended by Lattice, as a precaution to prevent spurious TCK pulses causing unwanted JTAG activity when no JTAG programmer is present. 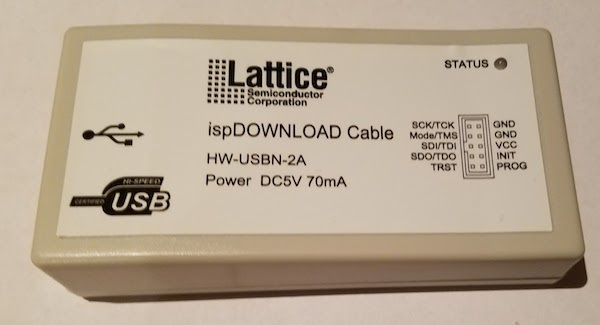 Lattice technote TN1208 for the MachXO2 family says on page 12-2 “TCK: Recommended 4.7kOhm pull down.” The other JTAG signals discussed here all have internal pull-ups. 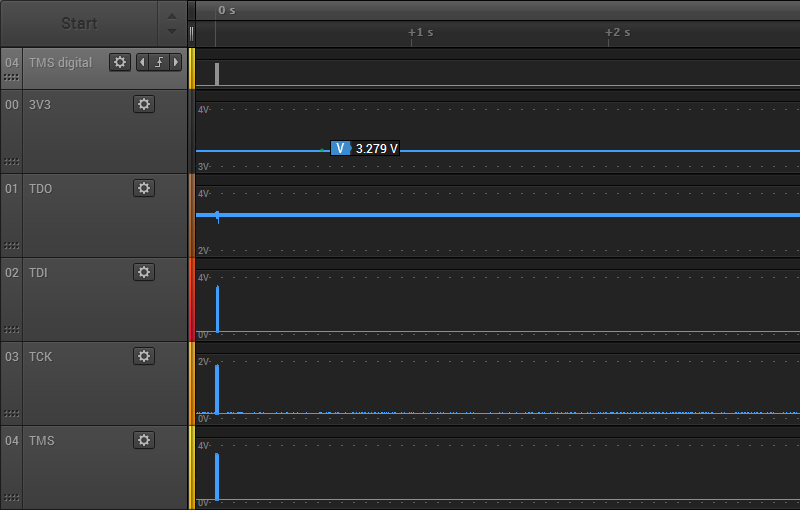 4.7K isn’t much, but maybe the JTAG programmer has an anemic drive strength and is unable to drive TCK fully to 3.3V with the pulldown present? I could try removing R3, but that wouldn’t explain why there are also some runt pulses seen on TMS and TDI. I double-checked to confirm I didn’t accidentally use the wrong value resistor for R3, but no: it’s 4.7K as intended. I also measured the resistance between TCK and GND, to see if there’s some other unintended low-resistance path to GND that’s screwing up everything, but it measured 4.7K exactly. Apple II disk controller cards are weird, there are a crazy number of different types, and many are rare and expensive. Can an FPGA-based solution save the day for retro collectors? You bet! 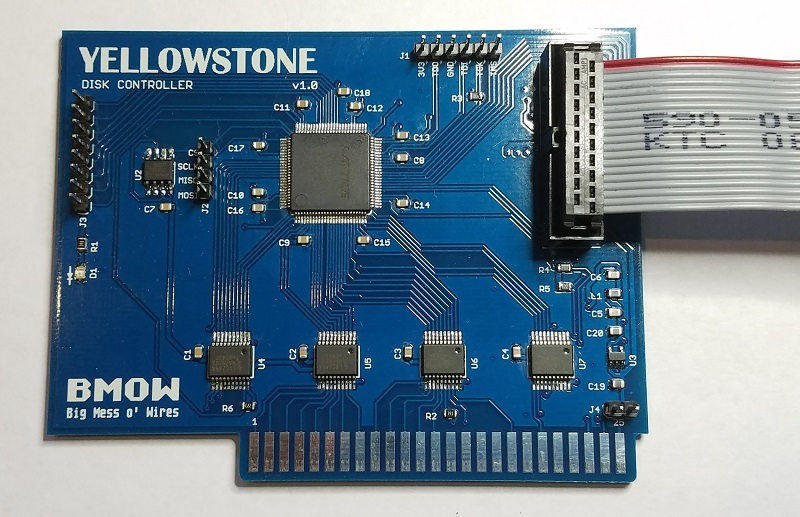 Nearly all the existing disk controllers connect the same 8-bit bus to the same 19-pin disk interface, so a universal clone is merely a question of replacing the vintage 80s guts of the card with a modern reprogrammable FPGA. 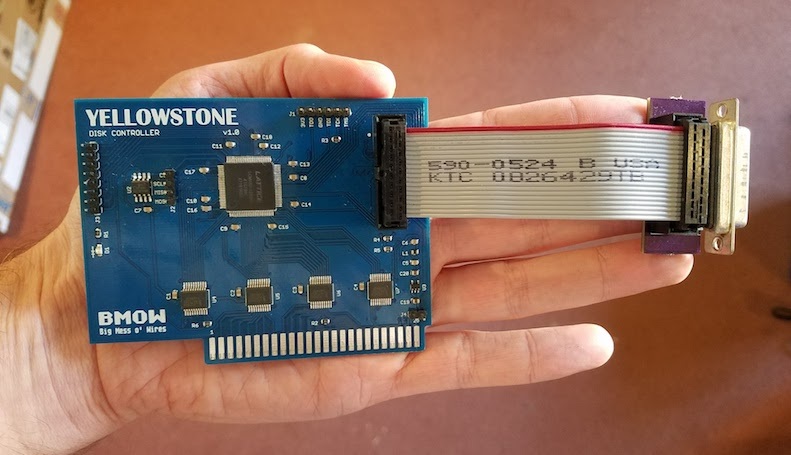 This hypothetical universal controller card could connect to almost any Apple II disk drive, or a Floppy Emu. Here’s my first attempt. This project has been nearly finished since August, but I’d hoped to delay announcing it until it was 100% done. Back in July there was a surge of interest in the Liron disk controller, when I updated the Floppy Emu firmware to add Liron support. For the first time, it was now possible to emulate a 32 MB Smartport disk on an Apple II, II+, or IIe with the Floppy Emu. But only Liron card owners could benefit, and the Liron card is fairly obscure and difficult to find. People started asking about the possibility of a Liron clone card, so I went to work. Mapping out the complete schematic of the Liron took a couple of days. It’s a single IWM (the famous Integrated Wozniak Machine), combined with a small number of standard 7400-series logic chips, and a ROM to hold the boot code. Writing Verilog code for the FPGA to duplicate the 7400 chips’ functions was easy. Creating a Verilog reimplementation of the IWM was harder, but with the aid of the IWM spec and a logic analyzer I got it done. By selecting a moderately roomy FPGA, I was able to incorporate the boot ROM functionality too, so no actual ROM chips are needed. 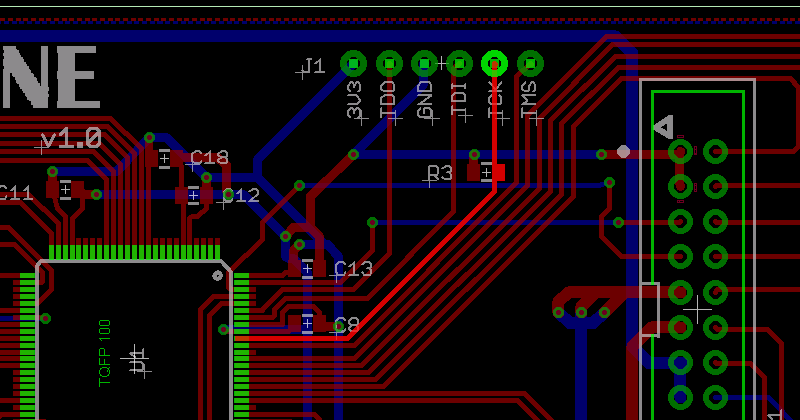 The entire design boiled down to some 3.3V level converters and a single FPGA, with a bunch of connectors and passive components. I realized the design wasn’t limited to being a Liron clone, but could also probably be a Disk 5.25 or Disk 3.5 controller with just a change of firmware. Maybe even a UDC controller. Ooh, the possibilities! I worked like mad to finish the design in late July, just before a trip to Yellowstone National Park, which gave this project its codename. The core of the prototype board is a Lattice MachXO2 FPGA, specifically the LCMXO2-1200HC. This 100-pin bad boy has 1280 LUTs for implementing logic, and 8 KB of embedded block RAM to serve as the boot ROM or for other functions. It also has some nice features like a built-in PLL oscillator and integrated programmable pull-up and pull-down resistors. Unlike some FPGAs, the MachXO2 family also has built-in flash memory to store the FPGA configuration, so it doesn’t need to be reloaded from an external source at power-up. The FPGA can be programmed through a JTAG header on the card. The external disk is connected to the card with a standard 20-pin ribbon cable, just like what you’d find inside an Apple IIc, or on the Floppy Emu. 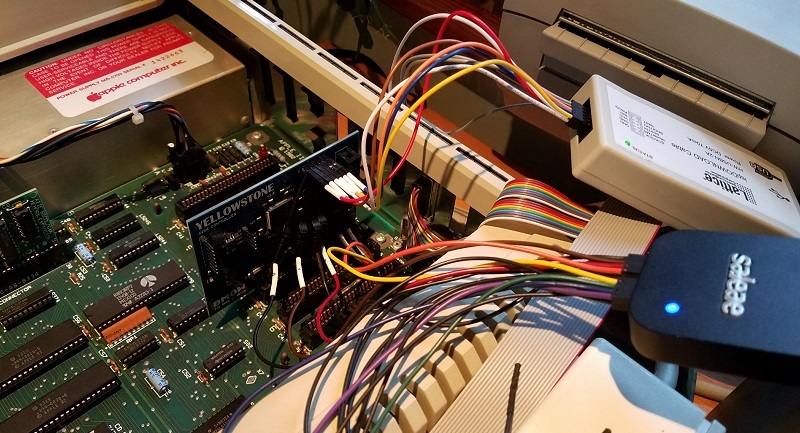 In fact for the Floppy Emu, you can connect a 20-pin ribbon cable directly from the Emu to the FPGA card, with no DB-19 required. 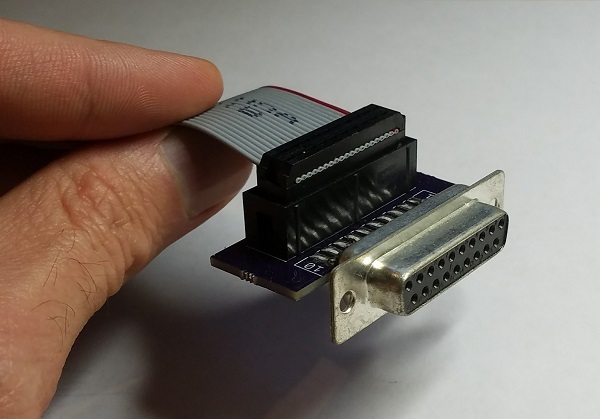 For other external disk drives, I built a small adapter that converts a short length of 20-pin ribbon cable to a DB-19 female connector. There’s a tiny 3.3V voltage regular on the board, which you can see at the lower-right at U3. It’s barely any bigger than a 0805 size SMD capacitor. Even with these small components, I was still able to solder the entire prototype board myself by hand. Just for grins I added a 2 MB serial EEPROM to the board, which you can see at U2. 2 MB is enough to store 14 disk images of 5.25 inch disks, or a single larger disk image. It’s not central to the design, but if it works then the card could function as an all-in-one virtual disk like the CFFA3000, in addition to functioning as a disk controller for external drives. More options! Here comes the embarrassing part. After July’s spurt of activity, the PCBs and parts arrived in the mail. And then I did…. nothing. Finally in October I assembled one prototype board, stuck it in my Apple IIe, and played with it for a bit. But since that day I’ve done…. nothing. I’m struggling with some internal dilemma about the balance between a hobby and a business, and doing things because I want to or because I think I should want to. I’m hoping that by publishing this summary, I may spur myself into further action. The prototype board works as far as I’ve tested it, but that’s not very far. I verified that I can program the FPGA via JTAG, and that it responds to address and data on the Apple II bus, but that’s about it. I haven’t yet looked at what it’s doing on the external disk interface, or tried connecting a real drive. My attention has just been focused on other things, and even though I always mean to return to this project “soon”, somehow I never do. There’s at least one serious bug with JTAG programming that needs to be addressed. When the board is outside the Apple IIe and powered from a separate 5V supply, JTAG programming works fine. But when the board is actually inserted in the IIe and powered from the slot, JTAG programming doesn’t work. It always fails with a communication error. I thought this might be some kind of noise or poor signal integrity on the JTAG traces when the board is in the IIe, but the traces are quite short and don’t cross any other signal traces that might carry interfering signals. I also thought maybe I had power problems, and the IIe’s 5V supply was drooping briefly when I tried to program the FPGA via JTAG. 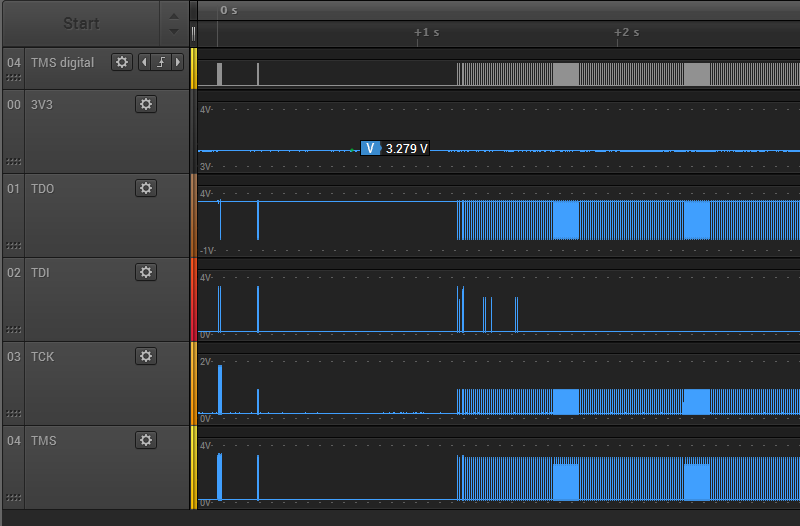 But as far as I can tell with a logic analyzer’s analog functions, the 5V and 3.3V supplies remain stable. It’s a mystery that will require some better tools and more careful testing. What’s next for this FPGA disk controller, assuming I ever finish it? Will it become a new product in the BMOW store? That was certainly my original plan, although my lack of motivation these past months has cast some doubt on that idea. I want to keep fun hobbies fun, and not have them become an obligation and a chore, which I fear is already happening with the other retro computer gizmos I’ve developed in the past few years. We’ll see how it plays out. Assuming this eventually becomes a new product, how will users reprogram the FPGA in order to clone a different type of disk controller? It’s not reasonable to expect that everyone will own a stand-alone JTAG programmer and know how to use it. Unfortunately I can’t see any alternative solution that wouldn’t require extra hardware and complexity, and push up the cost of the board. I might add a microcontroller and an SD card socket for loading alternate firmware, but that would be a fairly ridiculous amount of extra baggage if it were used only for JTAG. Perhaps the Apple II itself could be used as a JTAG programmer, with some extra hardware that optionally bridged the data bus to the JTAG interface? Sounds complicated, and it would leave the question of how to get the firmware onto the Apple II first. Or maybe the user could choose between a few different built-in firmwares using a switch, but would be unable to load new ones? That sounds more plausible, but would mean a bug in the firmware couldn’t be easily fixed.